Along with the wonderful views, we acquired an early 1900's barn. It was in rather desperate condition. Do we tear it down or take the pain staking time to restore it? We choose the later, again choosing to do what we could to preserve this way of life. There is still much to be done to truly restore this wonderful old barn and it may not see completion in our life time. It sat patiently waiting, as it had for many years before we came along, until our youngest daughter came to us and expressed her desire to have her wedding reception here at the farm and to use the old barn. With motivated help from the engaged couple and anyone and everyone they could talk into helping, the back breaking work began. The barn itself is a three story structure with what we call, "a walk out basement". The "basement" or foundation was built from old stone. A large percentage of which had fallen down, leaving the wooden structure that had been built on top of the stone, leaning and sagging desperately. Most of the stone was removed, a section at a time. 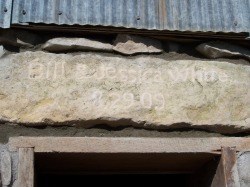 The structure was lifted and supported while the stone was re-laid. The original "basement" had been divided into small stalls for keeping livestock, using hand hewed beams, poles and handmade gates and doors. We were able to save much of the original interior, while still removing some of it to open up the area to make it more functional for our own needs. After an incredible amount of hard work from an almost unbelievable number of dedicated family and friends, our daughter's dream of a reception on the farm came true. The bride and groom couldn't have been more pleased with the outcome and have left their mark for generations to come. The guests, many of which had labored along side with us and many others who had heard of this tremendous task, enjoyed a beautiful afternoon and an incredible evening of dining, dancing, and joyous celebration . Through out the evening we heard numerous comments on the wonderfully quaint and welcoming atmosphere which we had created. A good share of these people also asked what the plans were for the barn after this big night. Honestly we had intended to use the restored and improved space for wintering new calves and their mothers. After much encouragement from those family and friends, the cows have not been invited into the barn. We have enjoyed using the space for family functions and for our annual fall party and hayride. We also store hay in this space through the winter. Be sure to visit our Photo Gallery for additional photos of the barn, the wonderful reception and some of the surrounding grounds that were used for wedding photos, including our 8 plus acres of Native Tall Grass Prairie.